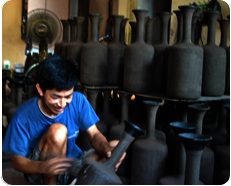 Hue, My Son, Hoi An. 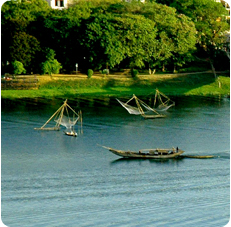 This trip allows us to get a deep appreciation for these beautiful regions and their people. 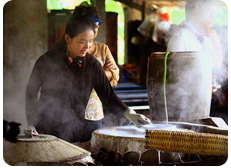 We visit the historical and charming town of Hue. 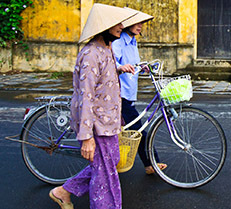 This ancient city has extensive relics of Vietnam's fascinating heritage. 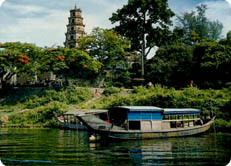 Splendid tombs, ornate pagodas and the remains of a once magnificent Citadel. 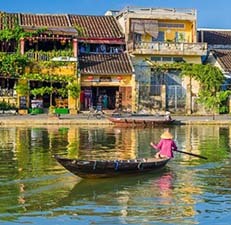 Next stop is Hoi An, a delightful fishing town, its narrow streets filled with colourful latterns, tailors, art galleries, traditional houses and much more. 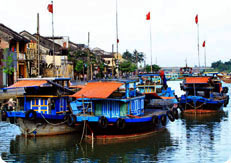 Come and discover all in one trip - Hue to Hoi An. 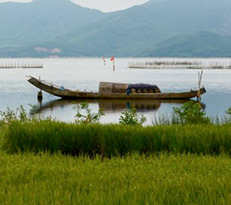 Hue is well-known for its beauty and isolation. Let’s the royal past come to life among the ruins of the Imperial Citadel. In the morning, we explore the Citadel, a fortress surrounded by a moat that has a 10 km (6 mile) perimeter! The site enclosed the land of eight villages and cover 6 km2 – sufficient area to house the Emperor and all his family, courtiers, bodyguards and servants. 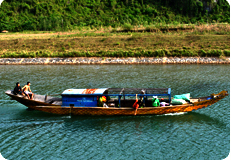 After lunch, we enjoy a boat trip along the Perfume River. 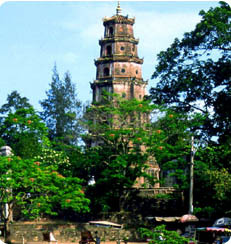 En route we call in the Pagoda of Thien Mu, tomb of Ming Mang and time permitting we explore the tomb of Tu Duc, before a short transfer back to our hotel. (Lunch and dinner are included). 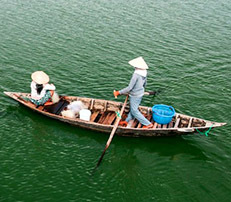 After our breakfast we head south through coastal rice paddies and traverse the spectacular Hai Van Pass to Hoi An. En route we stop at My Son Temple, the very former capital of the ancient Cham civilization that ruled central Vietnam between the second century and the thirteenth century. 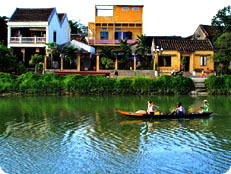 In Hoi An we relax in the township and stay overnight in a hotel. (Breakfast, lunch and dinner are included). 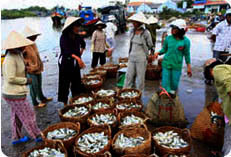 Early in the morning we explore the market of Hoi An. 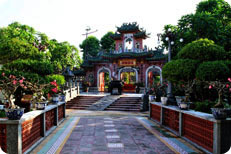 This is followed by a delightful stroll along the narrow streets and a visit to a local temple or some traditional Vietnamese houses. We return to our hotel for breakfast. 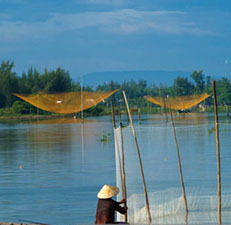 After that we cycle around some fishing villages and along Cua Dai Beach. Following our lunch in a local restaurant we enjoy a cycling ride past paddies to the village of Tra Que. Here, we meet local people at work. Tonight we dine in a beautiful local restaurant by river. We stay overnight in the same hotel. (Breakfast and lunch and dinner are included). 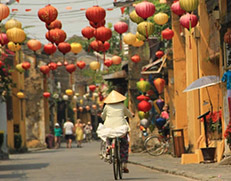 There is something in Hoi An, from historical architecture to art galleries and excellent shopping. We can depart anytime today. (Breakfast is included). - a 4-6 km walk on Day 1. - a 2-5 km walk on Day 2. - a 4-6 km walk on Day 3. - a 7-9 km bicycle ride on Day 3. - $345USD per person for a group of 2 to 3 people. - $298USD per person for a group of 4 to 7 people. 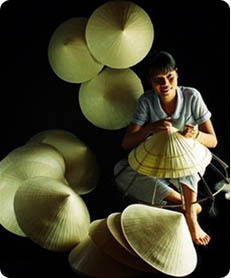 - $265USD per person for a group of 8 to 9 people. Pack essentials for 4 days, including light comfortable clothes suitable for outdoor activities, comfortable walking shoes.